Nobody knows the prognosis of a serious ankle or foot injury better than Dr. Perez, an Orlando, Florida-based foot and ankle surgeon. The words, “four to six weeks of non-weight bearing activity” have come out of his mouth more times than he can count, so you can imagine his dismay when he seriously injured his ankle. Disastrous is putting it mildly. The 51-year-old surgeon was in a state of panic after fracturing his ankle, instantaneously realizing that it would be impossible to perform surgeries on his needy patients while on crutches. Obviously a doctor cannot perform surgery unless their hands are free! Recognizing that he would have to refer his patients to other colleagues or postpone surgery, Dr. Perez made quick work of searching for crutch alternatives. Apprehensive at first, Dr. Perez pushed himself to become comfortable with the device. “I was surprised at how quick and easy it was to learn,” remembered Dr. Perez. Just 3 days after his injury,. 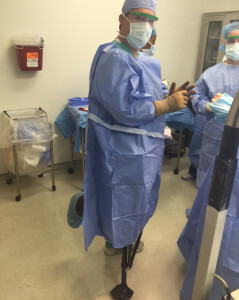 Perez was back to work, seeing and operating on his patients. “I was expecting to be out at least 4-6 weeks; iWALK2.0 allowed me to go back [to work] 3 days after the injury. That is incredible!” he exclaimed to his friends, family, colleagues, and very happy patients. Dr. Perez now recommends iWALK2.0 to many of his active patients who have suffered ankle or foot injuries!